"My wife and I drove UP to the Farm Shop for breakfast in Cross Hands- half the charge had gone-will we be able to get home.... What have I done?" That was January 2013. My first electric car (EV) -Citroen C-zero with it’s relatively tiny 14.5kWh battery. It was a big leap in the dark. My speciality was energy efficiency-lighting and renewables. I knew that climate change required bold action (we were less aware of air pollution at that stage). I knew that I could charge my electric vehicle from my solar panels and over 90% of that energy would go to propelling me forward-compared with less than 20% efficiency in my old Galaxy. What I didn’t know was how to drive it and where to recharge away from home. I was effectively stuck within 35 miles of my home in Carmarthen. The nearest garage to service it was in Bristol. Could be a challenge! Fast forward to today-I’m driving my 3rd EV and we’ve ordered a fourth for my wife. I have covered nearly 100,000 miles across Wales. They are an absolute joy to drive – talk about torque! We’ve saved so much money at the pumps. The United Nations Intergovernmental Panel on Climate Change (IPCC) recently published a landmark report, stating that governments must take urgent, unprecedented and far-reaching action by 2030 in order to limit global warming to a maximum of 1.5 degrees Celsius. On a positive note, technology like EVs, renewables, low energy appliances, LEDs and smart grids have progressed exponentially since 2013. They offer us all solutions and opportunities. In the case of EVs I can categorically state that they are far more fun to drive, cheap to fuel and have so few moving parts, they will rarely need fixing. Taxi firms (@BlackpoolTaxis @candctaxis) are reporting 200,000 miles with only wiper blade and tyres needing replacing. Bit like Trigger’s brush in Only Fools and Horses! I run mine from PVs as much as possible but I also get green electricity so am racing on wind and sunshine (Step 1 if you want to fight climate change). Which brings me to the issue of air pollution…sorry. It’s a bit of a shocker that we are just coming to terms with. Turns out, if you burn fossil fuels, the exhaust fumes are VERY bad for us. Many locations throughout the UK have ILLEGAL air quality. Schools in Cardiff are a particular concern. If you’ve read this far-you will have gathered that we need to walk, ride our bikes, take public transport (soon to be electrified!?) and if we really have to drive a car-share an EV. Scotland are changing the game in terms of providing electric charging points. However, if you live in Wales be prepared for a stiff neck and clenched buttocks. 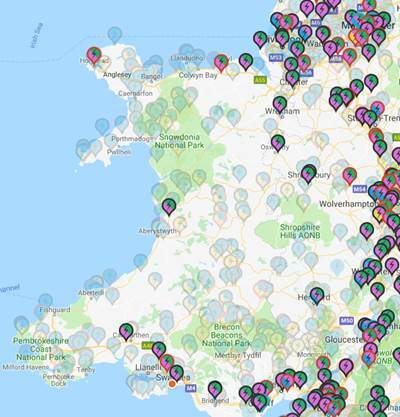 A quick glance at the charge point map will reveal a dearth of charging opportunities across the WHOLE of Wales. Milton Keynes probably has more charge points than our entire Country. Dundee has just won a global award. There is, however, hope for us here in Wales. Plaid Cymru secured £2million for EV infrastructure at the last budget. There is currently a six-week consultation being carried out by the Senedd’s Economy, Infrastructure and Skills Committee. There was great fanfare as the 1st rapid charger in mid-Wales was opened at The Cletwr, Tre’r Ddol, Ceredigion, by Polar. As welcome as it is, we urgently need pairs of rapid charge points on all our trunk routes at 30-mile intervals. All our car parks could have 10-20 fast chargers. Carmarthenshire Energy (@CarmsEnergy) are working with our Council to develop a strategy. In the meantime, demand for new EVs is outstripping supply by 3:1. The price of used EVs has doubled over the last 6 months. The change is happening and is accelerating. The clean air will taste sweet-it’s all the torque. 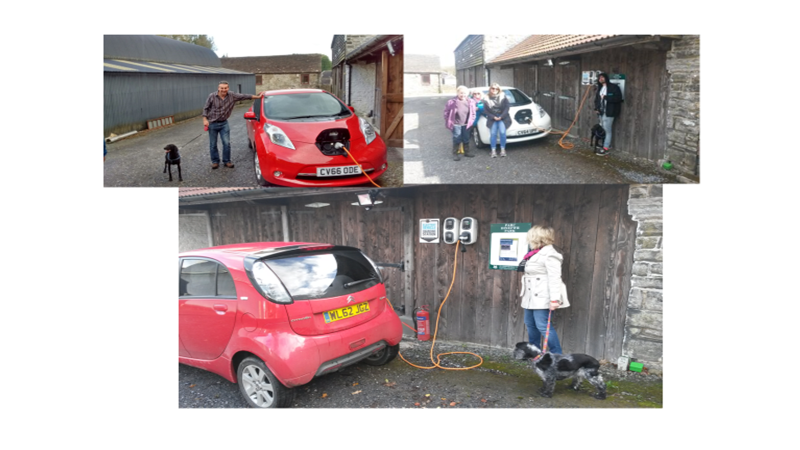 We now just need public bodies in Wales to wake up and embrace the “joy” of EVs.